Sometimes on Thanksgiving, we tend to worry we won't have enough. We worry we need more potatoes, more chairs, more time. This year, we wanted to remind our customers that there’s really only one thing we need more of: each other. So we shared recipes for families to cook together, crafts for them to make together and meals for them to share together—everything they need to spend more time with each other. We kicked off the campaign with a :60 broadcast spot to show our customers that on a day filled with so much more, what's most important is that there's a lot more love. When you think about more family time and togetherness, nothing is more iconic than the Thanksgiving table. The table is the centerpiece of our campaign, filled with recipes, crafts and inspiration. Customers can drag to explore our table and click on items to see how to make them together. We created beautiful recipe videos as another way to inspire fans to make these dishes at home. Each recipe name was handcrafted using ingredients from that dish. Using all of our social platforms, we shared our recipe and craft ideas for families and friends to make together and we encouraged customers to visit our table for even more. We took full advantage of the Facebook Canvas tilt-to-pan feature so customers could see more of our Thanksgiving table. Then they could swipe through galleries of recipes to make together and even explore ready-made platter ideas if they needed more time. We reached people in places where they’re already thinking about Thanksgiving. 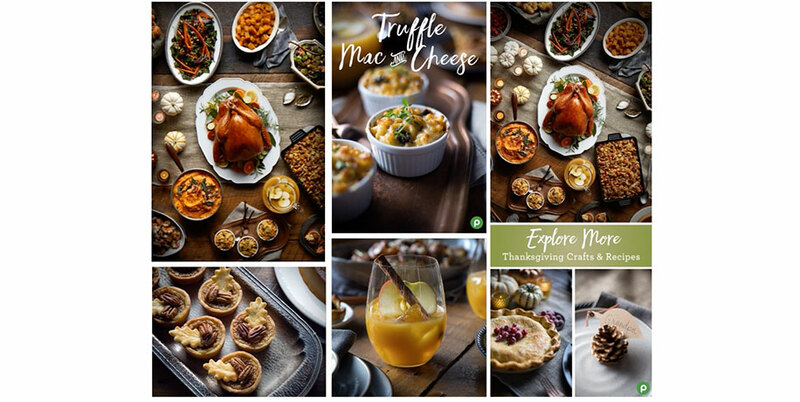 Using native ads, we wrote articles and shared images of our final dishes to give customers a taste of what kind of recipes were on our table this year. Then we invited people to explore more on our experience at Publix.com/Thanksgiving.